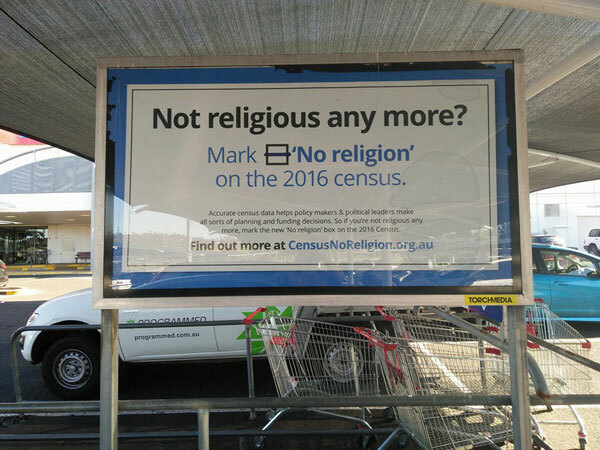 The Census is tomorrow and there’s been a few signs around explaining to people that if you are not religious anymore then you should mark the “No Religion” box on the census to provide the most accurate information. I understand the need for this clarification. Many people have been raised in a particular religion, but they no longer practice or even believe in that religion anymore. I was raised Christian, but I now identify myself as somewhere between Atheist and Agnostic so I will be ticking “No Religion”, because that most accurately describes what I believe. So, why the controversy behind asking people to accurately identify their religion. Well, because clearly it’s a Muslim plot to take over Australia. I’ve seen many people online in the last few days say things like they’re marking themselves as Christian because they don’t want to live with Sharia Law, or they’d rather live in a Christian country. Or by people marking No Religion it will give the Muslims more power. 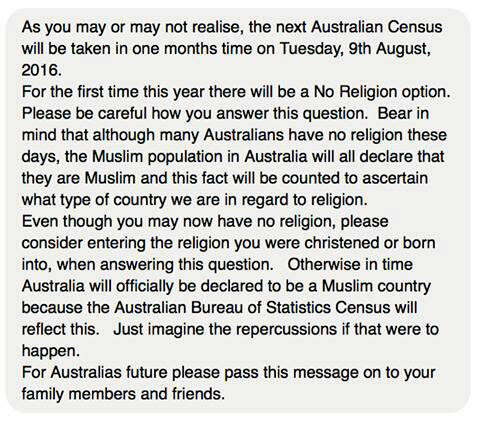 The most important thing to remember here is Australia is a secular country. No matter how many people mark themselves down as whatever religion – or No Religion – that will not change who has power in this country, because there is (or at least should be) a clear separation of church and state. That’s how things are supposed to be in this country. Even if less people mark themselves as Christian and more people mark themselves a Muslim, that does not mean that we’ll be a Muslim country and it certainly doesn’t mean that we’ll suddenly start abiding by Sharia Law. Also it would be the most absurd conspiracy theory that these signs were put up as part of a Muslim plot to take over this country, especially given that the signs were actually funded by the Atheist Foundation of Australia. If you want to direct your anger, hate and fear somewhere, you should probably be taking aim at the Atheists. Like myself. But if we want to talk about conspiracy theories – why are so many people suggesting that we should inaccurately identify themselves as Christians for the purpose of making it appear that more people in this country who are Christian than actually are, while also suggesting that a Muslim person accurately identifying themselves as Muslim is an act of aggression? I understand that many Christians are feeling a little uncomfortable that their religion is being given less and less priority. It’s that whole “When you’re accustomed to privilege equality feels like oppression” issue. Like how last year Victorian banned teaching children religious music in public schools outside of Special Religious Instruction and many people reacted as though Christmas had been canceled. 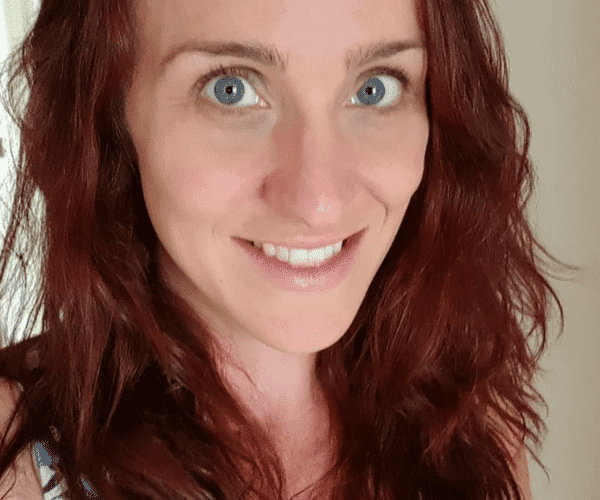 For some Christians being told they were no longer allowed to indoctrinate other people’s children into their religion without parental consent felt a little like they were having their right stripped away. Their right to assert that Christianity is the default religion of this country. And it’s not. The last census showed that only 61% of Australians identified themselves as Christian and there’s a good chance that number will be even less this year. However, if you are Christian you have nothing to worry about. You will still have religious freedom! That’s the beautiful thing about living in a secular country. Even if your religion does become a minority, you will still have the right to believe and worship and celebrate whatever religion you choose. The other worry that some people have is that if they don’t mark themselves down as Christian that means that more mosques will be built in their area. However, that’s not at all how it works. A place of worship or assembly requires a planning permit, which would be decided at local government level. And would not be based on census data. There would actually be very few grounds upon which you could actually block such an application too. Like maybe noise, traffic or car parking. Certainly you can’t deny a permit to one religious group based purely on population % of another religious group. If you believe in a particular religion then you should mark down that religion. If you don’t believe in any religion then mark “No religion”. And if you’re not sure you can always leave the question blank. But what you shouldn’t do is spread this hateful nonsense, because doing that would be just Un-Australian! I’ve been trying to get on all day and haven’t been able to! it’s incredibly frustrating! Plus I love filling in paper forms. once again i shall identify as an odinist. If anyone wishes to become part of the church of odin please do so as well. makes as much sense as any of the others, and has a longer history. I was actually looking forward to completing the Census tonight, but sadly haven’t received our letter yet :(. I’m just staying atheist! ?What a load of BS! Flying Spaghetti Monster! Why is it not an option?!! ??? ?